Make your own fuel pellets and reduce your heating costs down to CZK 2.500. We are a leading European manufacturer of pellet mills and a complete range of pellet processing machines. We specialize in processing of all types of materials, sawdust, straw, chaff, paper, fertilizers etc. The Green Energy pellet mills are used for production of fuel pellets, feed pellets, fertilizers as well as for pressing of materials for the purpose of saving the costs of waste disposal. Our sales have reached more than 2000 units for the past 6 years and we export to all European countries. 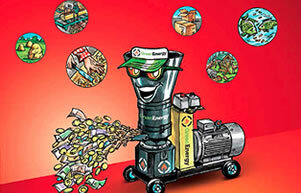 Are you satisfied with Green Energy pellet mills? Are you interested in sending news? We will send you action prices. We will invite you to exhibitions and fairs.